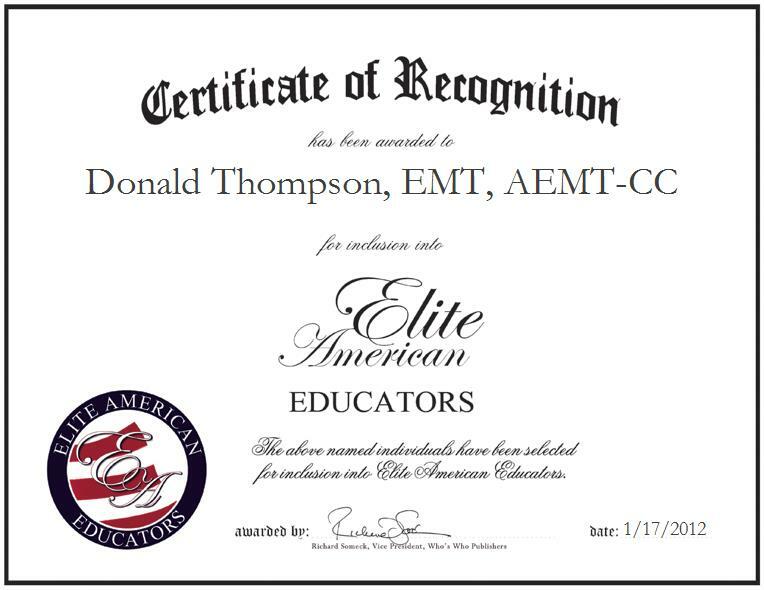 Donald D. Thompson, EMT, AEMT-CC is an Emergency Medical Technician and Program Coordinator at SUNY, Canton. Mr. Thompson specializes in emergency medical services, and in his current capacity, he acts as a liaison between hospitals and emergency medical technician classes, oversees course qualifications, and completes paperwork for clinical rotations at area hospitals for the basic and advanced life support emergency medical technician students. Inspired by the experience he gained after joining his local fire department in 1967 at the age of 18, where his father was a member and founding father of the local fire department’s rescue squad unit, Mr. Thompson has followed a continuous career path to success which has allowed him to teach others to grow in the emergency medical services field. Mr. Thompson is a two-time recipient of the Emergency Medical Service of the Year Award, a two-time recipient of the Educator of Excellence Award, and the Emergency Medical Service County Leadership Award. He has also been named Fireman of the Year.